Düsseldorf houses “the longest bar in the world,” Germany’s finest shopping boulevard Königsallee, and countless museums, theatres and attractions underscoring the city as a major arts centre. 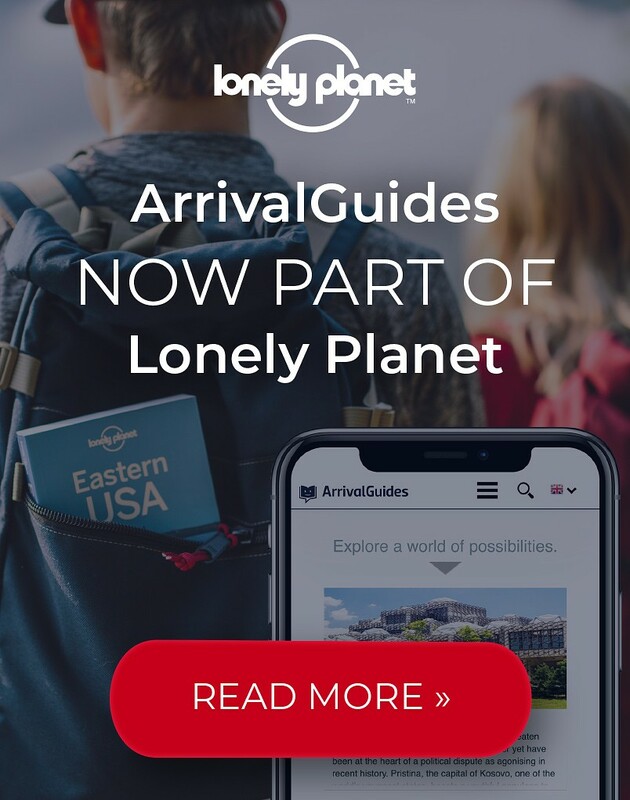 It offers the legendary cheer of the Rhineland with all its quaint traditions in perfect harmony with all the luxuries of a truly cosmopolitan city. You are invited to discover this great city. Opening hours: Generally, shops are open from 9.30 or 10.00 till around 18.00 - 20.00. All larger stores are open till 20.00 on Saturdays. Sundays closed. 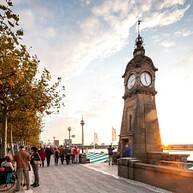 Düsseldorf’s urban and cultural landscape has a cosmopolitan flair that is unrivalled by most other German cities. Choices in the Rhine metropolis cover a wide range – in business, fashion, culture, lifestyle and sports. 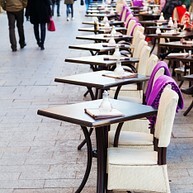 Düsseldorf’s Königsallee is one of a small group of internationally famous streets that may justifiably call themselves boulevards. Affectionately called the “Kö” by Düsseldorf’s residents, it is the primary shopping street in Düsseldorf, and as its nucleus connects the city centre to provide a continuous shopping experience running from the Altstadt (Old Town) through to the Kö and all the way to Schadowstraße. Come along, see and be seen – and do some truly stylish shopping as well. 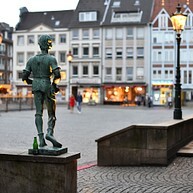 Nowhere else in Düsseldorf can one feel the city’s heartbeat so clearly as in the Altstadt. Those who want to party, people in search of culture or history lovers will all be equally well catered for in this area between the Rhine and Heinrich-Heine Allee, that covers an area of less than half a square kilometre. This tiny space is crammed with around 260 eateries, pubs, bars, discos and restaurants, and one would be hard pressed to find the like in any other city. The Altstadt is also home to Altbier – a real Düsseldorf speciality. Burgplatz is where the little River Düssel, which gave the town its name, flows into the Rhine. In the background is the former collegiate church, St. Lambertus, with the shrine of St. Apolinaris. Next to the bridge over the Düssel, the monument to Düsseldorf being granted the privileges of a town demonstrates impressively more than 725 years of town history (town status granted in 1288). The square is dominated by Alter Schlossturm, the old palace tower (now the Schifffahrt-Museum navigation museum) and last testimony to the princely palace from the 13th century that fell victim to flames in 1872. The generously proportioned Rhine embankment promenade is considered one of the most beautiful on the Rhine. Upriver, the Medien Hafen is characterised by outstanding architectural creations, and the elegant district of Oberkassel on the opposite bank by art-nouveau facades. Carlstadt is the city’s exquisite quarter of galleries and antique shops. Citadellstraße with its elegant stately residences from the 18th and 19th centuries and the flair of its streets almost unchanged since these days, seems to have escaped the passing of time. A more profound insight into Düsseldorf’s history can be gained at Stadtmuseum at the corner of Bäckerstraße and Berger Allee. Its cosy garden is treated as an insidertip! The Carlsplatz, and its lively food market open from Monday to Saturday. From here, take the attractive Bilker Straße for a visit to the Heinrich-Heine- Institute or proceed past the former residence of Robert and Clara Schumann to Bastionstraße, a must for every lover of antiques. The Rhine tower, the North Rhine-Westphalia parliament, the Gehry Buildings, the city gate or Colorium – MedienHafen is a hotspot for creative architecture in Düsseldorf. Several international architects played a creative role in the reconstruction of the old Rhine port area. Frank O. Gehry, David Chipperfield, Joe Coenen, Steven Holl and Claude Vasconi were among those who made a creative contribution to make it what it is today. Those goods depots which were protected by a preservation order had to be renovated with hi-tech engineering and creative interior design. The ancient storerooms have been recreated with a new style and grace. 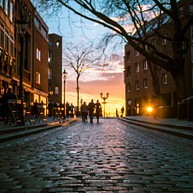 However, you can still feel the old port atmosphere everywhere despite all the reconstruction. Just a decade ago the warehouses were nothing but immense empty spaces inside. Today, various television channels and radio stations, and advertising and media agencies, design bureaus and suchlike have all set up shop inside. So that’s where the name came from: MedienHafen, which means media harbour. The MedienHafen also plays in the premier league where hospitality is concerned. From the exquisite “Berens am Kai”, with a Michelin star, through the “most golden” curry sausage in Düsseldorf, to a cosy cocktail in the evening – the restaurateurs here have adapted to their heterogeneous clientele, which is composed of business customers during the day and the funky in-crowd in the evening, who all meet up to party at the stylish “Rudas Studios” advertising film venue or at the “Port Seven”. The Rheinturm (built 1979 – 1982, architect H. Deilmann) is a striking landmark on the Düsseldorf’s Rhine skyline. It stands on the edge of the southern city centre, at the entrance to the MedienHafen, right beside the North Rhine-Westphalian parliament building (Landtag) and the building of the public broadcaster, Westdeutscher Rundfunk. It is 240.5 metres high, with a glass-fronted 180-seat restaurant at an altitude of 172.5 metres that rotates on its axis. A bar and lounge is located below the restaurant (168m) as is a viewing platform (164m) with a breathtaking view of the Rhine metropolis: the MedienHafen, the Altstadt, the Hofgarten, Königsallee and the Rhine with its family of bridges all lie at the feet of the tower. When the weather is good, one can see as far as Cologne Cathedral. Thanks to a level entrance in the basement of the tower, the building offers barrier-free access. Düsseldorf has the third largest Japanese community on the European continent after Paris and London. In the vicinity of the Immermannstraße, you can find a wide range of Japanese supermarkets, book shops, restaurants and more. 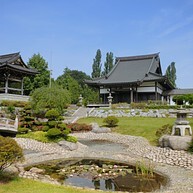 The EKŌ-House - since 1993 a centre for Japanese culture - consists of a Buddhist temple (the only Japanese temple in Europe), Japanese gardens, a traditional house with tearoom and, since 1999, another building including a library and an international kindergarten. The most important function of the EKŌ-House is the cultural exchange between East and West: Japanese citizens cultivate their traditions and allow local citizens the unique opportunity to participate. 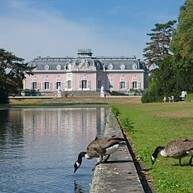 Schloss Benrath (Benrath Palace) was built as a pleasure and hunting palace for the Elector Carl Theodor. Today, the ensemble in its artistic unity of buildings, interior and gardens, 60 hectares in all, is considered one of Europe’s rare complete works of art of the late baroque period. The main palace building (corps de logis), with its furniture, porcelain, paintings, etc., gives an impression of court life in the second half of the 18th century. The eastern wing houses the “Museum für Europäische Gartenkunst” (Museum of European Garden Art) and the western wing the “Museum für Naturkunde” (Museum of Natural Sciences). 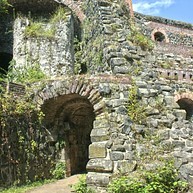 On the edge of the picturesque centre of Kaiserswerth, the mighty ruins of the legendary Emperor Barbarossa’s medieval palace rise directly from the riverbank, once one of the most important fortresses on the Rhine. 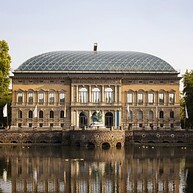 Tonhalle, home to the 'Düsseldorfer Symphoniker', also hosts many international guest performances. The city's orchestra consists of 130 musicians, and with its many tours in this country and abroad has made an excellent name for itself far beyond the city borders. Two cities, two branches: The Deutsche Oper am Rhein and the Ballett am Rhein Düsseldorf Duisburg have jointly performed at Düsseldorf’s Opernhaus (1,292 seats) and Theater Duisburg (1,079 seats) since 1956. With one of the largest opera ensembles in the world and one of the major ballet companies in the German-speaking region, it is one of the prime addresses for musical theatre and dance in Europe. The programme includes: Grand Opera from baroque rarities all the way to contemporary musical theatre and a ballet that sets new standards with uncompromising aesthetics. The Kunstsammlung Nordrhein-Westfalen presents a demanding and variegated exhibition program at three locations: at the K20 Grabbeplatz, at the K21 Ständehaus and at the Schmela Haus. Around a half-century ago, in August of 1961, the regional government of North Rhine-Westphalia established the Foundation of the Kunstsammlung Nordrhein-Westfalen. The purchase of 88 works by artist Paul Klee was the “opening salvo.” Since then, the Kunstsammlung has become one of the most recognised art museums worldwide, with a collection which ranges from Classical Modernism to American Pop Art and major contemporary works. Added in early 2002 as the second main pillar of the Kunstsammlung and accommodating contemporary art was the Ständehaus am Kaiserteich, until 1988 the seat of the Parliament of North Rhine-Westphalia. Four wings with continuous arcades surround the building’s central public area, a spacious plaza. The creative treatment of this representative building in the Historicist style (1876-80) by the Munich architectural office of Kiessler + Partner created a modern museum building with a striking glaze domed roof which shapes the building’s aesthetic and at the same time spans an expansive sculpture garden located on the uppermost level. Together, a flexible hall for temporary exhibitions in the ground floor level and the upper galleries comprise more than 5300 m² of surface area. Installations and artist’s rooms are an important focus of the Kunstsammlung, an area which has been expanded continuously in recent years. 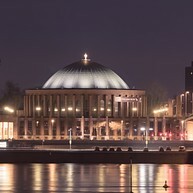 The Museum Kunstpalast, which was redesigned by Oswald Matthias Ungers and opened in 2001, is located in the centre of Düsseldorf, right on the Rhine river. Ever since it reopened, the house has gained a splendid international reputation with its high-quality exhibitions, such as Miró, Dalí, Warhol, Caravaggio, "Bonjour Russia", "Diana and Actaeon" and Per Kirkeby. 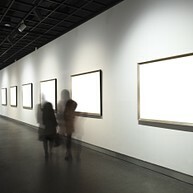 The permanent exhibit too, whose spectrum ranges from medieval sculptures to an outstanding assortment of Baroque graphic works up to paintings of the Düsseldorf School of Painting and Expressionism, as well as contemporary photography, is held in great esteem all over the world. The Hentrich Glass Collection is also found in the Museum Kunstpalast, and is the most comprehensive glass collection in Europe, tracing the development of glass artistry without interruption from luxury glass objects of the pre-Roman period up to glass art from contemporary studios. The Robert Schumann Hall, a multifunctional hall offering a sophisticated program running from chamber music to cabaret, is also integrated into the museum. KIT - Art in the tunnel (Kunst im Tunnel) - is a part of the Kunsthalle Duesseldorf and will offer a new exhibition-room lying underground. Above the tunnel room, 850 sqm in size, the visitor ﬁrst enters the boardwalk café designed by the studio Prof. Fritschi Stahl Baum. Arriving underground in the tunnel-room, he will be greeted by the an ensemble of artistic works, which develop their particular magic at this special place.